Donations of any amount are most welcome and appreciated! 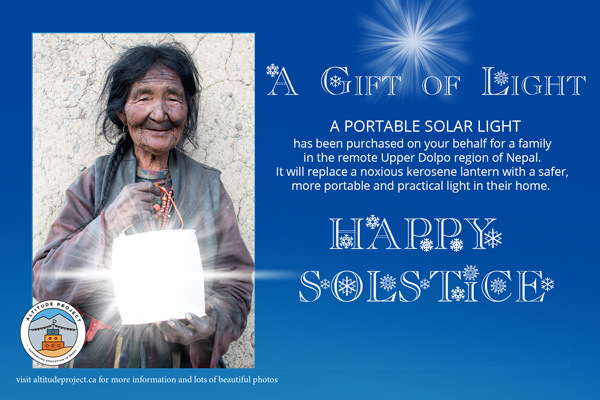 For example: $25 will by one solar light for a home; $50 will buy school supplies for one student. 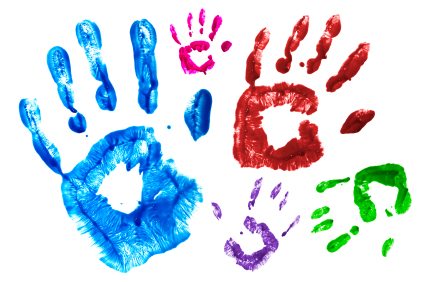 Larger donations will help support the entire school budget with teacher salaries, food supplies for lunches, repairs and maintenance costs, as well as school supplies for the children. 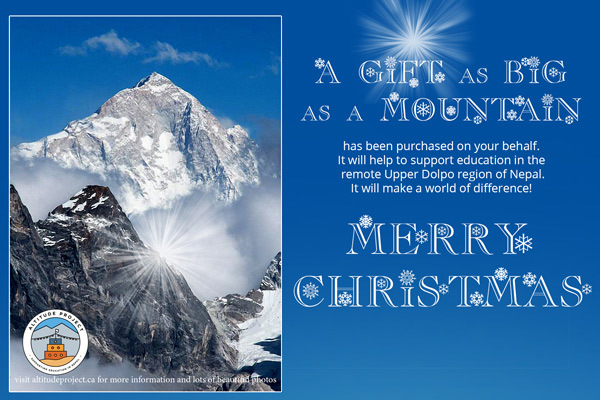 We suggest using the e-Card “A Gift as Big as a Mountain” for donations of $100 or more! 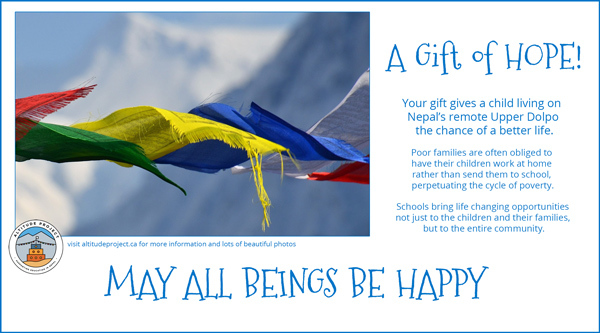 By that way, the photo on that e-Card is of Makalu – the fifth highest mountain in the world at 8,485 meters! Each card links to a larger downloadable image. 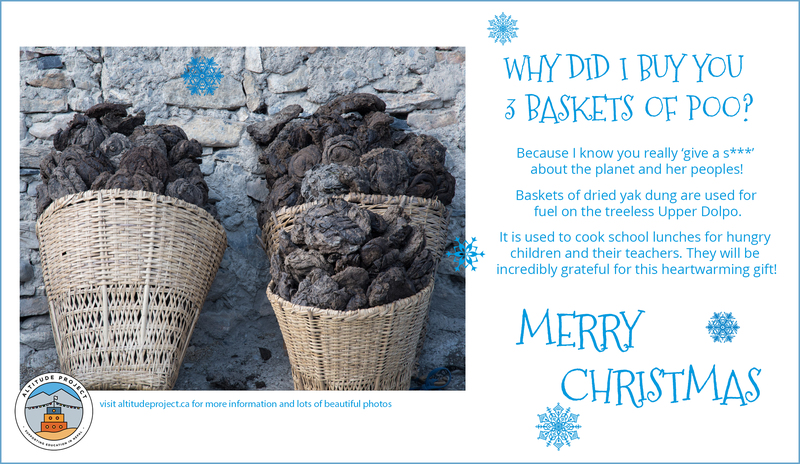 We will be happy to personalize the cards for you. 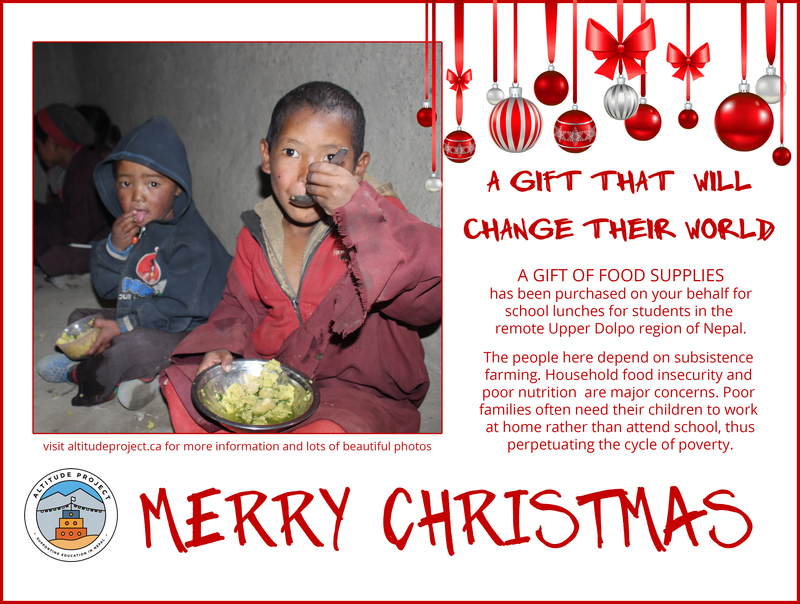 Altitude Project’s primary mission is to support education in the remote Upper Dolpo region of Nepal. The Dolpo is one of the highest, harshest, inhabited places on the planet. Saldang village, and its neighbours, are accessible only by foot, it is a 5 day walk over two 5,000 + metre passes. Wind and weather conditions are extreme. Most years the passes into the villages are closed by snow during winter. This region is culturally rich, it is considered a “last enclave of pure Tibetan culture.” But it is materially poor. The people depend on subsistence farming and families are often obliged to have their children work at home rather than send them to school, perpetuating the cycle of poverty. Saldang School has ~ 80 students. Karang School has ~ 40 students. Komas School and Ku School each have ~ 30 students. The schools bring life changing opportunities not just to the children and their families, but to the entire community. Unfortunately they are very minimally funded by the government and rely on help from the international community to operate. In addition to helping support these schools, Altitude Project assists with community infrastructure projects like health posts, water systems and greenhouses, and with solar lighting.